Vitamin C is an essential requirement for the synthesis of collagen. Collagen is a primary substance that holds the whole body together. Deficiency of Vitamin C leads to a condition called scurvy. Lack of this vitamin and also inadequate intake of water causes exhaustion, anaemia and sometimes ulceration in the gums and loss of teeth. 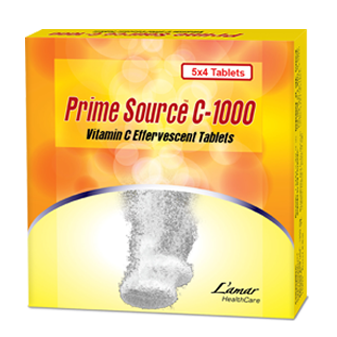 Prime Source C-1000 is a vitamin C rich effervescent tablet taken as a dietary supplement to keep the body hydrated. Vitamin C - 1000 is a solution taken orally to synthesize collagen, and this helps to revitalize the body with full energy.